The TrackingForLess Tracking Starter Package (TSP) contains all the hardware and accessories you need to start tracking your vehicle or asset. By selecting one of our prepaid tracking plans, as low as $9.95 per month, you can view the location of your vehicle or asset through our web-based portal or using our mobile tracking apps for iOS or Android devices. Additional trackers can be added to your account for applications like fleet tracking or theft recovery. Technical support is available should you have any questions about the hardware or tracking software. 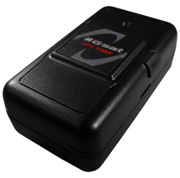 NOTE: This tracker is designed for the T-Mobile Cellular Network.